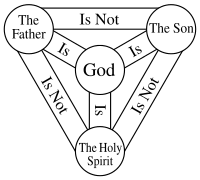 This coming Sunday is Trinity Sunday, when we celebrate all that God is, the varying aspects of his character and ways in which we experience him. I decided last year that this was no conundrum, no mystery, no puzzle – it is just how God is (sorry to my tutors!). This doesn’t mean God isn’t amazing and holds a whole spectrum of himself together – just that I’m not going to worry about how it works – because it really isn’t a problem, it’s just about knowing God, and the delight that he can be experienced in different ways. There is one God, but we encounter him in different ways. God the Father created the world and lovingly cares and tends it; Jesus his son came and lived on earth to show us God’s way of being human, showing us his ways in a form we could grasp; and the Holy Spirit is God with us day by day, whispering in our ear, prompting us, nudging us, helping us continue to grasp God’s ways. 12 I have much more to say to you, but right now it would be more than you could understand. 13 The Spirit shows what is true and will come and guide you into the full truth. The Spirit doesn’t speak on his own. He will tell you only what he has heard from me, and he will let you know what is going to happen. 14 The Spirit will bring glory to me by taking my message and telling it to you. 15 Everything that the Father has is mine. That is why I have said that the Spirit takes my message and tells it to you. Father, Son and Spirit – all God, in different ways and times. Each showing us the intrinsic God, loving us, guiding us, deserving of our worship – always there when we need him in a way we can access.